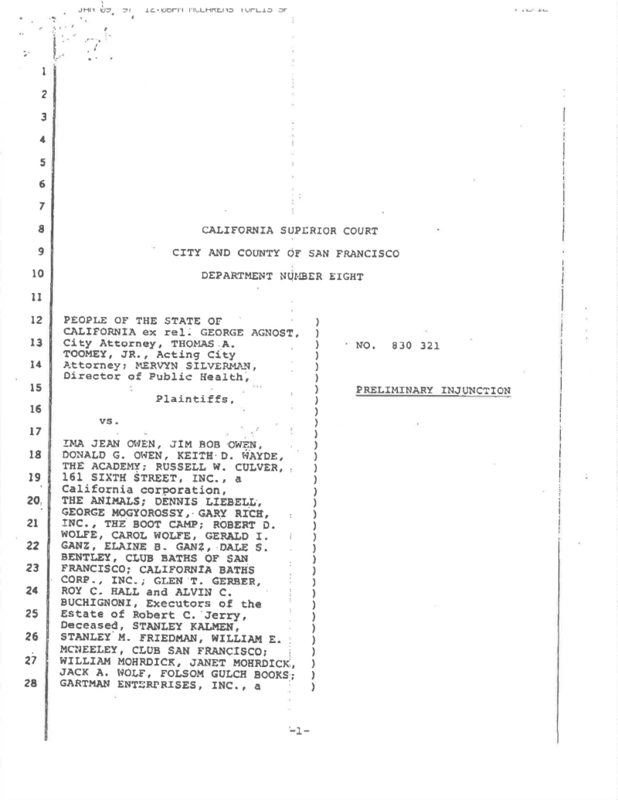 My blog post last month stating the injunction shutting down San Francisco's gay bathhouses in 1984 pertained only to specific businesses and specific addresses, contained a mistake. The injunction and supporting court documents all clearly spell out a blanket ban, put in place to potentially stem the AIDS epidemic. I regret the error, just as I regret the lack of gay bathhouses in the City. I believe my confusion stems from a possible injunction issued after 1984, when at least one such establishment, the 21st Street Baths in the Mission district, a document I cannot find in my paper archive. 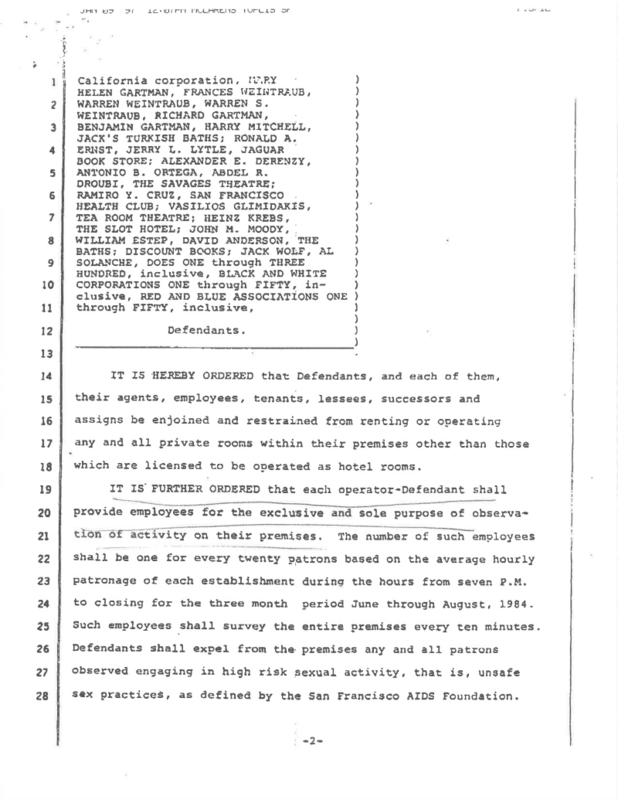 However, I did locate the nine-pages of documents from 1984 issued by Judge Roy A. 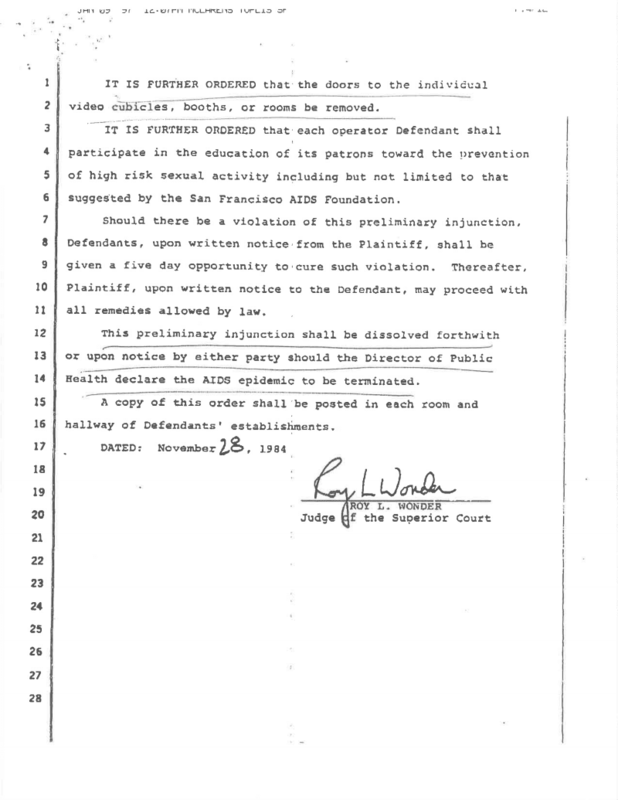 Wonder, as two separate rulings and one exhibit document detailing what constituted risky sexual behavior putting a person at risk of contracting HIV. 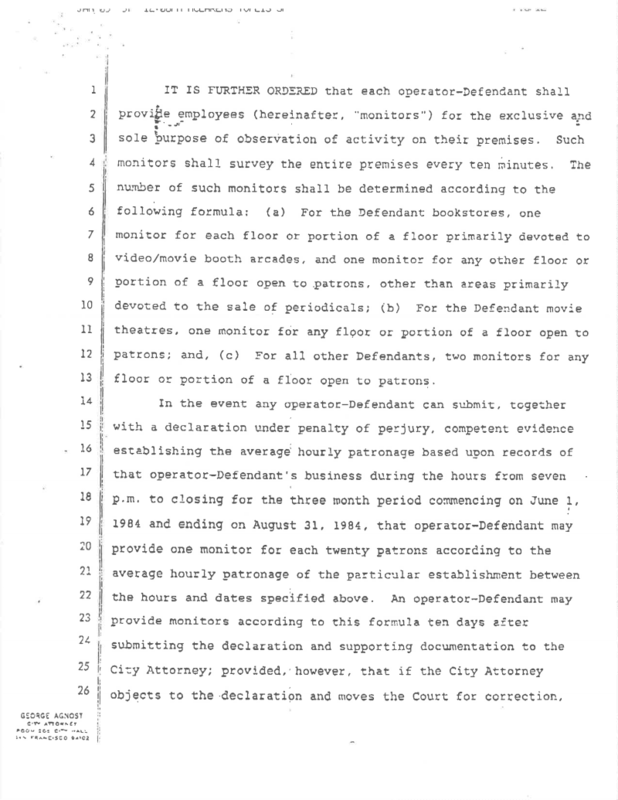 You can read the entire documents here: Part 1 (Preliminary Injunction), pictured, Part 2 (Modified Injunction) and Part 3 (Exhibit A, High Risk Sexual Activity). The documents were obtained from the Superior Court's archive. Tomorrow, Wednesday, July 17, starting at 1:00 pm, the permits division of the San Francisco Police Department will consider bathhouse applications filed by eight businesspeople. The public meeting takes place at the Hall of Justice in Room 551, 850 Bryant Street. Kudos to Chris Roberts of the SF Examiner for breaking the story about the applications filed with the police. I love reading your blog posts about life back home in San Francisco. Your tenacity in keeping officals on the straight and narrow is inspiring. My health has returned to me, in no small part due to health care in WA vs. Florida. Best Wishes to you buddy!